Ensuring healthy food and a safe environment lies at the heart of our vision! To make this vision a reality and fulfill our mission, we aim to develop patentable technology platforms based on the latest scientific knowledge to create healthy and safe solutions today and for the future. Our technologies protect people by eliminating pathogenic microorganisms and chemicals in the environment using ecological, safe and healthy products. ​Our mission is to help reduce foodborne illness and people's exposure to chemicals in the environment and the food they consume. We want to help food safety and sustainable development leaders achieve their goals. 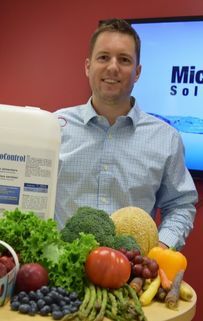 Passionate about microbiology, François specializes in food safety from farm to plate. For several years, François has been putting his expertise at the service of leaders in food safety and sustainable development to achieve their goal.